Worried about the costs involved in repairing those shabby dents on your car? At Mahindra First Choice Services, we help you get an estimate on your car denting and painting cost without the physical inspection. The online dent estimator tool helps you calculate an approximate car painting cost, car dent repair cost, car scratch repair cost and cost for all minor and major damages. The online dent estimator tool is easy to use. Just enter details of your car and about the damage, the tool will calculate the approximate denting and painting cost for you. Convenient, isn’t it? So, if your car needs a denting and painting job, go online and get an estimate on our Dent Estimator tool now! Get a quick estimate on Bumps and Dents in just a few steps. Please share your details. You are just one step away from your estimate. OTP will be sent on this number. *Excluding taxes. Actual cost might vary upon physical inspection. The estimated price is for minor dent & paint jobs and does not include cost of any body part/spare/accessory which may be required to repair the damage. In some cases repairing damage may compromise factory-built safety of the vehicle. In such cases physical inspection by an expert is recommended to advise Repair or Replace. Mahindra First Choice Services (MFCS) does not encourage repair of such parts/cases and shall not be held liable. Few minor smudges in areas such as - below the body line, curves and edges may be repaired through 'Spot Repair' techniques. However, quality of Spot repair is not as good as complete panel repaint and repair may be clearly identified if properly seen. As per the Motor Vehicles Act, the car will not be painted in any other colour except the original colour mentioned in the car documents. Some damages cannot be repaired: Example - bumper is broken in a place where it is attached to the body and the clips cannot hold the bumper, the panel is too stretched or severed. Though these can be fixed, but we suggest replacing them. 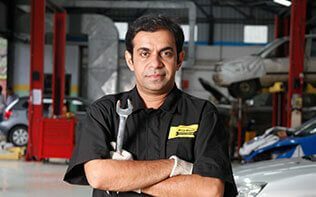 The estimate given is just an indicative one and the actual estimate might vary depending on physical inspection by a qualified MFCS technician.